Distinguishing Characteristics Hispanic female. Light brown hair, brown eyes. Tammy sucked her middle and ring fingers at the time of her disappearance. Tammy and her brother Diego disappeared from Victorville, California on October 23, 2007. They were abducted by their non-custodial father, Francisco Flores. He never returned them after a scheduled visitation. A felony warrant for kidnapping was issued for him on January 18, 2008. Photos of Francisco are posted with this case summary. His date of birth is April 23, 1974, making him 33 years old at the time of Tammy and Diego's abductions. He's described as Hispanic, 6'0 and 210 pounds, with black hair and brown eyes. Francisco has a mole on his nose and a mole on each cheek. He may have grown his hair long and grown a beard. Francisco was in the process of a divorce from the children's mother, Griselda Gonzalez, in 2007, and they shared joint custody. Gonzalez called them daily to check in, however; she stated Francisco is unpredictable and has a volatile temper, and claims he abused her. No one answered the phone when she called on October 23, and she went to Francisco's house and found it vacant. 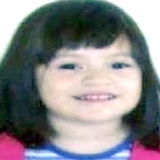 She went to authorities at this time and was given full custody of Tammy and Diego on October 31. Authorities learned that Francisco refinanced his home for $100,000 before the abduction and took the money with him. (The house has since been foreclosed.) He had a job at a cable company and had been a model employee for ten years, but when he kidnapped the children he walked away from his job without giving notice. Francisco has dual Mexican/American citizenship and he has relatives in Mexico City; Gonzalez is also originally from Mexico. Francisco and the children may be in Mexico, or they may still be in the Victorville area or in Oregon. Ontario, California police are investigating Tammy and Diego's abductions and some agencies say they disappeared from there. Their cases remain unsolved. Updated 8 times since October 12, 2004. Last updated March 24, 2016; two pictures added, details of disappearance updated.